www.cpa.portal.gov.bd published New CPA job circular in there website. There are total 12 vacancy available on this Recruitment Notice. HSC,SSC,Honours/Degree Student are able to apply this CPA govt job circular. For Apply Chittagong Portal Authority you have to visit http://jobscpa.org website. This is full time jobs for Bangladeshi People. 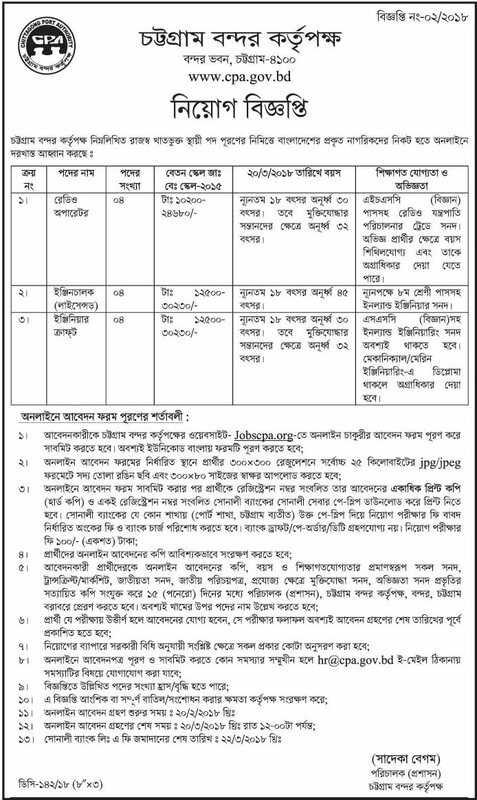 Computer Operator,Libratian,Lower Division, Gas Curter etc post are available on this New GOVT CPA Circular in Chittagong. Applications Deadline: 20 March 2018. For Age limit, Salary , Educational Qualification and Bank Draft etc check below this Original circular. If you want to Apply this circular read this circular carefully. You have to apply this circular before 20 March 2018. For Next updates about CPA job circular admit card and Result Bookmark this website. Thanks for Stay with us. This entry was posted in Chittagong, jobs Newspaper, Jugantor and tagged Govt. jobs by ejobscircular. Bookmark the permalink.